If you’re celebrating Chocolate Day away from your significant other or a close friend or family member who shares your love for the treat, send them something sweet! One of our favorite chocolate-themed gifts? Chocolate orchids, also known as oncidium orchids. They have a lovely deep brown color and emit a warm, chocolatey smell. Orchids live a long time with the proper care, so this is the perfect lasting gift for a loved one. You can also simply have a box of delicious chocolates delivered alongside a beautiful bouquet. 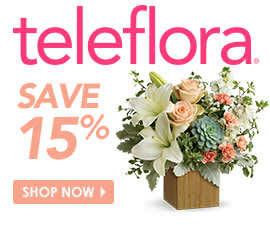 Teleflora’s Full of Love or Smile for Me bouquets can both come with chocolate, so pick out whichever one your significant other would like best. For families, a great way to spend Chocolate Day is to take a tour of a local chocolate factory or candy store. Many chocolate businesses, large and small, around the country offer tours where visitors can learn how they turn cocoa beans into the treats they love to eat. Many even offer free samples at the end! Did you know that chocolate and wine actually pair pretty well together? Actually, chocolate goes well with any number of other sweet and savory ingredients, so it can be a lot of fun to have friends over for small chocolate bites. Set out pieces of dark and milk chocolate, different cheeses, salty foods like nuts and potato chips, spicy foods like peppers, caramels and anything else you think would go well with wine, and allow guests to find their favorite pairings. Chocolate martinis – or chocolatinis – are all the rage these days, and who wouldn’t like them? Celebrate Chocolate Day with friends or a significant other by whipping up a batch in your own kitchen. Use chocolate liqueur, Creme de Cacao, vanilla-flavored vodka and half-and-half. Or, head to a cocktail bar near you if you’d rather have a mixologist make the drink. Cocoa isn’t just a dessert – it’s a more common ingredient in meals than you might think. If you and your family love chocolate, do some research to find a recipe with cocoa that everyone will love. One thing you can make is mole, which is a traditional sauce used often in Mexican cooking. It’s a slightly sweet and tangy sauce that goes perfectly with chicken, enchiladas and Mexican rice. Or, whip up a dark chocolate marinara sauce to serve over spaghetti. Just add a bit of dark chocolate to your normal marinara recipe – the end result is a touch more rich than usual. All of these are great ideas for celebrating Chocolate Day, but the best way? Eating chocolate as it’s meant to be served – for dessert! You can cook a traditional chocolate-filled desert, like brownies or cookies, or do something a little more luxurious if you think the occasion calls for it. Bake a warm chocolate melting cake, for instance, or serve chocolate fondue for dessert with fruit slices and marshmallows. No matter how you choose to celebrate Chocolate Day, make sure you enjoy yourself – easy to do when there’s chocolate involved! Happy National Chocolate Day! National Chocolate Day celebrated on July 7, but apparently it s also celebrated on October 28, December 24 and on September 13 it s INTERnational Chocolate Day.